1. 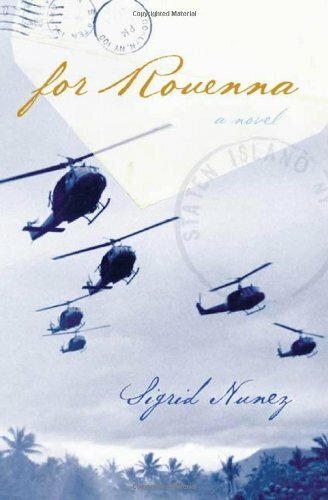 Sigrid Nunez has described For Rouenna as being “as much about a writer finding her subject as about an army nurse who served in Vietnam.” In fact, the novel might be said to have two main characters: Rouenna Zycinski, and the novelist who tells Rouenna’s story. To which character do you relate more, and why? Why do you think Nunez chose to write the book from the first-person point of view of the novelist rather than from Rouenna’s point of view or from the point of view of a third-person omniscient narrator? 2. For Rouenna has been called “an entirely different kind of war novel.” Compare this book to other novels about war you have read. In what ways is Nunez’s novel different? Discuss the ways in which Rouenna is both like and unlike other war veterans you may have read about or may know personally. 3. It is only after she learns of Rouenna’s death that the narrator feels compelled to research and write Rouenna’s story. What do you think she hopes to accomplish by this act? What are some of the things the narrator learns from her investigation into the life of this “stranger” from her past? What are some of the things she must accept she can never know? 4. How would you describe the narrator’s view of Rouenna when the two women first meet? How does this view change? How does Nunez use the narrator’s telling of Rouenna’s story to illuminate the character of the narrator herself? Describe how your own opinion of each character has changed by the last page. 5. One significant piece of information deliberately left out of the story is a specific explanation for Rouenna’s decision to end her life how and when she does. What do you make of this omission? 6. Both Rouenna and the narrator come from the same city housing project, but they end up going very different ways. A person’s relationship to the past and how he or she remembers that past is a major theme in all Nunez’s fiction. How is that theme played out in the lives of each of these women? What aspects of your own past do you believe still have a strong hold on you? 7. The narrator is surprised to learn that Rouenna volunteered to go to Vietnam. Does that decision seem surprising to you, and why do you think she made it? Discuss how Rouenna’s life before she goes to Vietnam might have influenced the way she experiences the war. Discuss how her year of service affects the rest of her life after she comes home. Imagine she had never joined the army. How do you see her life then? 8. During the Vietnam war, military recruiters routinely lied to nursing students. These young women were told that, if they joined up, the army would cover some of their school tuition but that no nurse could be sent to Vietnam unless she wanted to go. Rouenna came to believe the military was justified in this deception because it was the only way they could get nurses to the combat zone, and without those nurses more American troops would die. Do you agree with Rouenna? If not, what do you think should have been done instead? 9. Consider various issues explored in For Rouenna in light of the ongoing conflict in Iraq. For example, the attitude of the US government and military toward the young men and women sent to serve their country “over there,” whether the US should rely strictly on a volunteer army or consider reinstating the draft, and the role of ordinary civilians in a time of war. In your view, how is the current situation similar to the situation during the Vietnam era? How is it different? 10. In general, fiction writers have produced far fewer stories about friendship than about marriage or family. It has been suggested this may be because, in a friendship, there is “less at stake” than in other relationships. Do you believe this is true? How would you describe the friendship between Rouenna and the narrator? Discuss some of the other relationships between the various characters in the book. Which ones are the most authentic and resonant for you?